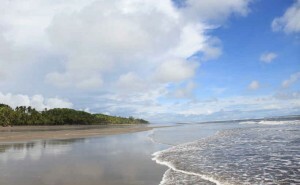 Occasionally a subscriber will have a property that can be rented in different configurations. For example, a 5 bedroom house could be rented to a large group, or it might be rented to five individual groups. We don’t have a lot of demand for the lockout feature, but for those that require it, we do offer it. 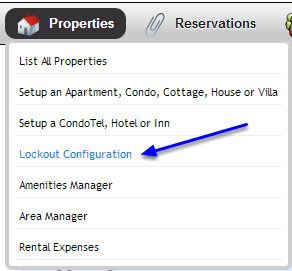 Step #1 shows the location of the Add New Lockout button, use it to setup a new lockout. A lockout is basically a dependency. For example if Unit A is rented, then don’t allow Units B, C and D to rent. How do we not allow a unit to rented? By blocking it off of course! Thus in the example above, if the KIWI HOUSE is rented, then Lockout the WAIKATO HOUSE, THE TIFFANY COTTAGE, THE RETREAT HOUSE, THE PEACE COTTAGE AND THE MIRANDY COTTAGE. 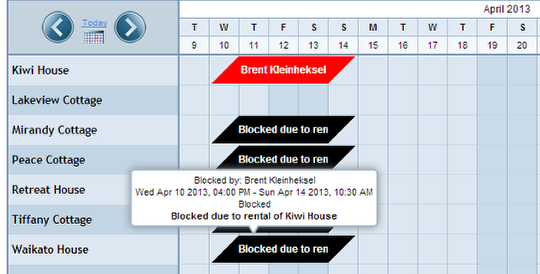 On the Calendar Tape, after a reservation is made for a property with a lockout dependency, the units locked out by the rental are blocked off in black and a comment is displayed “Blocked due to rental of the Kiwi House.” The blocks can be easily removed at any time by double clicking on the block for each unit. Initially we have setup a couple of rules to keep the interface manageable. Single unit properties can only lockout single unit properties; and..
Roomtypes can only lockout roomtypes belonging to the same multi-unit property. Look at it like this, “if (insert property name) is rented, then lockout (insert property name).”. First choose the property that is being rented from the dropdown, and then.. Choose from the list of available properties, and either click + or drag and drop the property from the left column to the right column. The properties on the right (Area #3) are the properties that will be licked out (blocked off) when the property chosen in Step #1 is rented. Click the SAVE button to save the lockouts. REMEMBER the rules listed in the previous step! Only single-unit properties can lock out single unit properties and likewise only roomtypes within the same multi-unit can lockout roomtypes within that same multi-unit property. You guys are on a tear these days… nice to see new features launching so frequently. THANKS!